SAN JOSE, Calif. (AP) Having missed out on the biggest prize on the free-agent market, the San Jose Sharks are now content to wait and use their ample salary cap space to acquire a difference maker in a trade if one becomes available. The free agency period opened Sunday with star center John Tavares turning down an offer from San Jose to sign a $77 million, seven-year deal with his hometown Toronto Maple Leafs. 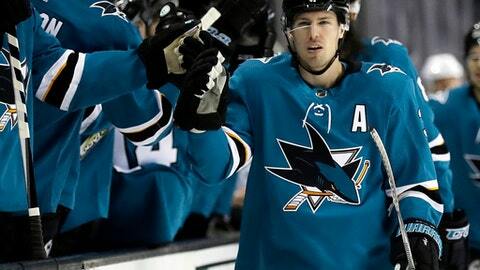 The Sharks also finalized a $64 million, eight-year extension with Logan Couture but saw their hopes of teaming him and Tavares as a formidable pair of top two centers thwarted. Wilson said he viewed Tavares as the only difference maker on the open market in free agency and didn’t feel like he missed out on getting another player while negotiating with Tavares. The Sharks still have approximately $20 million in salary cap space, some of which will be used to re-sign Joe Thornton in a deal that should be completed quickly, according to Wilson. San Jose also needs to sign restricted free agent forwards Tomas Hertl and Chris Tierney but will have money to acquire other players if they become available on the trade market. Wilson sees no reason to rush into any moves with a core in place that also includes high-scoring forwards Evander Kane and Joe Pavelski, defensemen Marc-Edouard Vlasic and Brent Burns, as well as goaltender Martin Jones. Keeping Couture was much easier than luring away Tavares since he never had any desire to leave the franchise he initially joined as a first-round pick in 2007. Couture was San Jose’s most dependable center last season, often matching up against the opponent’s top line and providing plenty of offense of his own from the second line. Couture had a career-high 34 goals last year and was a major part of the power play and penalty killing units. Couture has 34 goals and 47 assists in 96 career playoff games, ranking in the top 10 in the NHL in playoff goals and points since making his postseason debut in 2010. He feels the pieces are in place for more postseason runs, even without Tavares on board. ”Our team’s goal is to win right now,” he said. ”It’s not to wait a few years. We want to go out. We want to win. Obviously the goal going into next year is to win the Stanley Cup. That’s many teams goal. I’m sure Doug has many things he has going on but obviously that’s not my job.